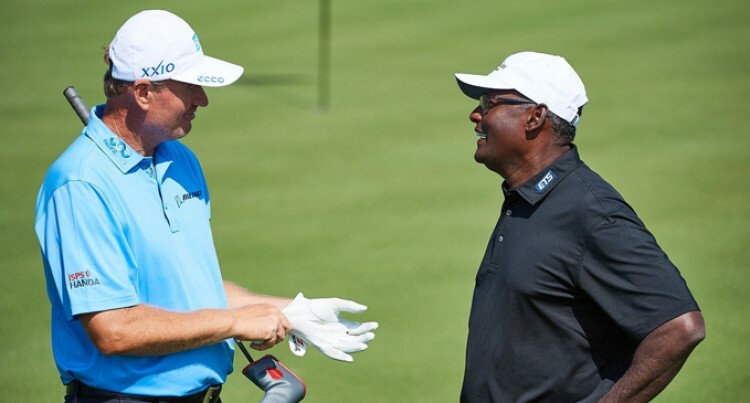 The Big Easy, former major champion Ernie Els turned on a dazzling display on the final day of the Fiji International sponsored by Fiji Airways at the Natadola Bay Championship Golf Course yesterday. Els finished the day on 11 under 69, after starting the day with five under. The tall South African was a popular figure on the course and had a big following trailing his group aound the greens. The group included second place winner Andrew Quayle who finished on 13 under. “It was really a great day, “ Els said. On whether he felt he had chances on the back nine, Els said he did almost as much as he could. On Quayle, Els said he had a great game and great attitude. “He’s got the whole package. He hits it long, he’s got great touch, and under the gun he really brought his stuff. “What a place,” Els said when asked about Fiji. “Wish I can come back in the future.